The Pacific Poetry Project’s first volume, Alive at the Center, aims to capture the thriving poetic atmosphere of the Pacific Northwest. It concentrates on the three major cities that define it—Portland, Seattle, and Vancouver B.C. This anthology, compiled and edited by an outstanding poet from each city, is a cultural conversation among the unique urban communities whose perspectives share more than just a common landscape. 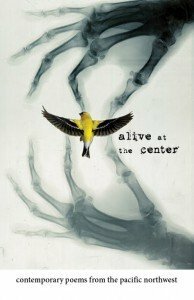 Alive at the Center features distinctive, contemporary poets who speak to the individual spirits of these Pacific Northwest cities.